Many varieties of artichoke are grown in Sicily, where this dish originates. 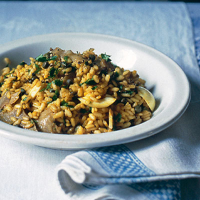 An adaptation of a recipe in Patience Gray’s Honey from a Weed, this risotto is great for entertaining, as it’s left to sit for ten minutes before it’s served. First prepare the artichokes: strip off all the leaves and remove the hairy choke inside. Trim and peel the stalk. Thinly slice the hearts and stalks and place in a bowl of water with the lemon juice. Scatter over the capers and the chopped parsley and cover with a folded, clean tea towel, before pressing down the lid. Leave to sit in a warm place for ten minutes. Scatter with the hard-boiled egg and serve with a green salad. Artichokes pose problems for some wines. Barbera is Italy’s answer to most food-matching challenges; its intrinsic acidity will work well with this soothing rice dish.